I recently decided to sponsor a child with leprosy. Granted I didn't sponsor the entire child. The agency allows people to sponsor parts of a child. I chose to sponsor the left index finger and the right "pinky toe" of some boy named Aleijandro or something. Anyway, the best part of this sponsorship thingy is if any part of the child you're sponsoring falls off you don't have to continue payments. I like that. I get credit for doing good without the long term commitment. 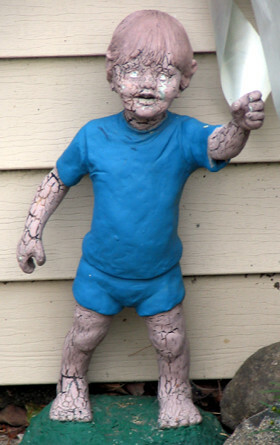 So as a result of my commitment the agency sent me this wonderful lawn statue as a gift. Thanks. I'll send you my psychiatrist's bill. Social commentary gives me immunity from psychiatrists (and their bills). Now, had I entitled it "Leper Children's Fund Manifesto" then I'd be fair game.